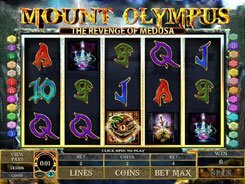 This is a classical three-reel video slot powered by Microgaming. 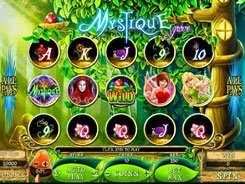 The game has a Vegas-style look and feel, with a little touch of magic. 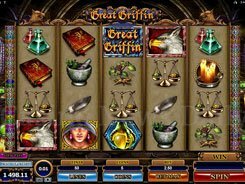 Having no wilds, scatters, free spins and any bonus rounds, this no-frills game offers nice payouts and an authentic gaming experience, since it closely resembles a traditional one-arm bandit. 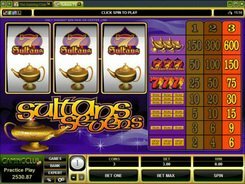 You have two betting options to configure: a coin size ($0.25–$5) and the number of coins per spin (1 or 2). From that, the max wager is a modest $10. The symbols are cherries, bars, red sevens and a blue star. 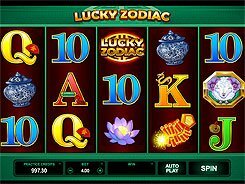 The second-largest award of your bet multiplied by x200 is granted for three Seven symbols, and the top prize is a x1600 jackpot yielded for three Blue Stars. 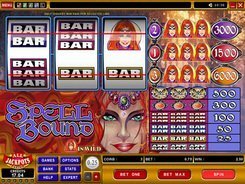 So if placing the maximum wager per spin, your win will amount to a stunning $8000 in cash equivalent. 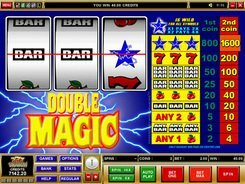 Having very simple rules, friendly budget and decent payouts, Double Magic will appeal to rookies and slot veterans alike.